The Very First Patented Capo in the World! This is a real gem in my collection. 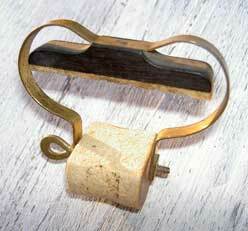 It is the very first capo that was patended 1850 in the US. It has a ebony bar - very much like the cejilla - with a leather pad. A springy yoke (looks like brass) is fastened with a screw on top of the bar and is fastened with a brass screw to a wooden reel under the neck. What looks like a nut is the folded end of the yoke with a threaded hole. The reel is dressed with thin leather and has a flat surface. The capo is permanently attached to the neck by removing the reel. By turning the flat surface away from the neck the spring force from the yoke will hold the capo. To open it, turn the flat surface up towards the neck. US patent in 1850 by James Ashborn. Capo ad from the 1890's. The locking mechanism is placed at the end of the bar, consisting of a screw with an adjustment nut at the lower end and an eccentric lever on top. The wide hole in the yoke allows the screw to slip out of the slot in bar. Brass with leather padding. I found no patent. Perhaps the application wasn't followed through? The turnable pressure bar has four different shapes to suite fretboards with various radii. 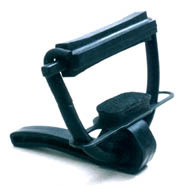 The capo is tightened with an eccentric lever on the back of the instrument neck. US patent in 1977 by Elliot L Myerson & Richard W Gillis.